The latest special offers from Disney Cruise Line for Florida Residents and US Military Personnel are available to book today through Sunday, January 25, 2015, while inventory lasts. Canadian Resident can save on select sailings now through March. The number of sailings are starting to dry up as we approach the spring break season. The offer for Port Canaveral sailings is available for anyone to book. Additionally, there is a half off the deposit for a 2015 sailing when booked by February 15, 2015 using the booking code HALF. This is not a discount on your cruise, but rather a discount on the initial deposit required when booking a Disney Cruise. The remainder of the deposit will be due upon final payment. This offer is not valid on Categories with Restrictions (IGT, OGT, VGT), Suites or Concierge Level staterooms or any sailings where the full payment is not required at the time of booking. The offer cannot be combined with other offers or discounts. This entry was posted in Special Offers and tagged 2015, CAN, Canadian Resident Rate, Disney Fantasy, Disney Magic, Disney Wonder, Florida Resident Rate, FLR, Miami, Military Rates, MTO by Scott Sanders. Bookmark the permalink. How come DCL doesn’t offer California residents any discounts? In the past, there were rates for California residents when they were trying to fill cabins when sailing from Los Angeles. 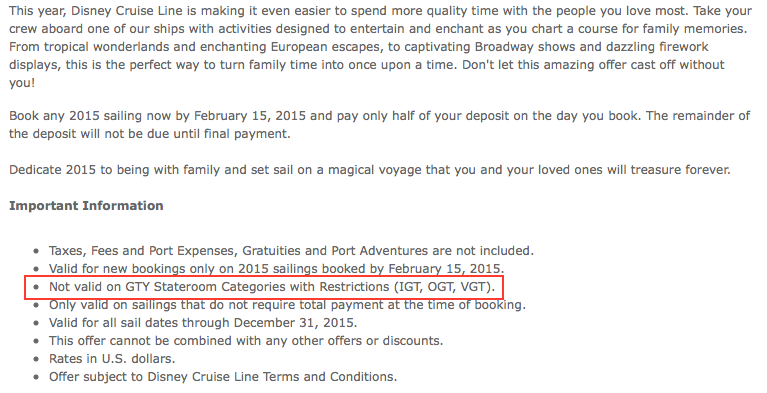 The writers of this blog really need to learn the difference between gt rates and a gty room assignment. I was going off the original details that have been corrected. Thanks to Tammy for helping me figure out the issue.